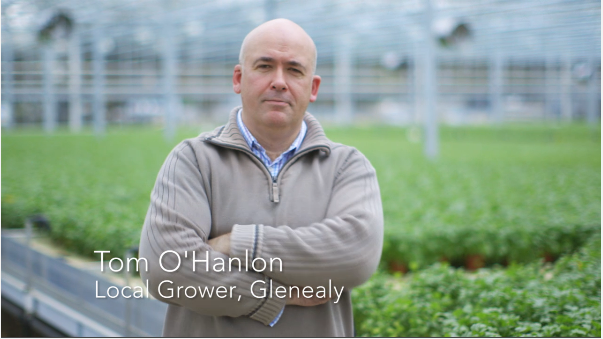 Tom is a Herb grower, based in Wicklow. Find out more by taking a virtual video tour of the farm. It all started in my back garden and packing herbs in the kitchen! The business has grown over the last number of years and last year we celebrated 25 years. We now grow all the culinary herbs with our most popular being coriander, basil, parsley, mint and rosemary. Everybody wants fresh ingredients and over the last ten to fifteen years people have become accustomed to using natural flavourings. At O’ Hanlon’s, our aim is to get the product in and dispatched as quickly as we can, in order to provide our customers with the freshest produce possible. As we are feeding peoples senses, it is enormously satisfying to see people using and enjoying our produce. Herbs are after all an adornment to food and we take great pride in producing a product which people take pride in cooking with. It’s as simple as that! Total Produce as a group are extremely customer and market focused which is very important to us. We work to ensure our herbs are of the highest quality so it is integral for our business to have a partner who share our values. I am situated in Glenealy, co. Wicklow. I am located only 45 minutes from Dublin City Centre and 50 minutes from the nearest Total Produce depot.